The most unusual book I’ve read in quite a while is ROOM by Emma Donoghue. It is the story of a young woman kidnapped and held captive in a small space for years. The premise itself isn’t that original; in fact, it seems lifted straight from the evening news, but Donoghue’s treatment is fresh and her characters so real they leap off the page. I won’t spoil it by going into a lot of plot details. As I said, the plot itself is not unique. What sets the book apart is the point of view. We experience the story through the eyes of Jack, the child born to the kidnap victim, fathered by her captor, a shadowy figure known to him as Old Nick. Who could resist an opening like that? Donoghue has taken a nightmare scenario and created a surprisingly uplifting story. It’s a story of unconditional love, of resilience and the will to survive, a story of civilization in primitive conditions. The only person Jack has ever known is his mother, whose love for him is achingly real. He has never known meanness or hatred. He is a precocious little boy, happy most of the time with life in his 11 x 11 world. He doesn’t know enough to be dissatisfied with the little he has. Among the few possessions Jack and his mother can claim are a few books. She has taught him to read and given him a love of stories. She has also devised a daily routine filled with a variety of activities. They sing and play games of their own invention. They do have a TV, but Ma only allows it to be turned on for a short time each day, because, as she has taught Jack, too much TV will rot their brains. They exercise every day, doing laps in their small space, sometimes jumping from one piece of furniture to another (Jack’s favorite). They do crafts, using materials they salvage from the meager supplies that Old Nick brings to them. One of Jack’s playmates is a snake who lives under the bed, constructed from egg shells and other bits and pieces that he and Ma have gleaned from things most of us consider trash. Jack thinks there are “thousands of things to do”. We know that for his mother it is a very different story. Though the story never shifts to her point of view, we understand the significance of her moods in a way that the innocent child telling the story cannot. We feel her desperation and her sense that time is running out and appreciate all the more the remarkable job she has done in making life bearable for Jack and her attempts to give him the skills he will need if they should ever be freed. 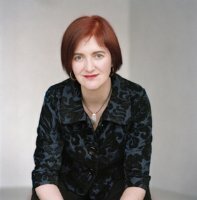 Donoghue has established a unique voice for Jack and, in doing so, has created a provocative novel. I plan to look for other books by this author.